Workers make their way across the extensive site by bicycle. It is a maze of flashing lines and tubes, compact systems the height of a house, reactors, silos and boilers. And it is all there to achieve a single powder at the end of all the chemical processes: adipic acid. Cooled, dried and cleaned several times over, it could almost be powdered milk. The crystals are white, odourless and non-toxic. "Adipic acid is an important primary product for the production of many plastics," explains Jens Metzner. Metzner manages the Radici Chimica Deutschland GmbH plant at Zeitz Chemical and Industry Park which is situated in the south of the German federal state of Saxony-Anhalt. The white powder is primarily used in the production of nylon. Known to many for its use mainly in the clothing of the 1960s, this chemical fibre is now used in weather-proof and competitive sports clothing. It also finds its way into shoe soles, foam mattresses and even toothbrushes. The adipic acid made in Zeitz is also used in the production of so-called polyurethanes, certain plastics and softeners. It can be found in airbags, as well as soft plastic dashboards. "Whatever form it is processed into, it can be found in almost every area of daily life," highlights Metzner. Metzner, who hails from Bremen, has been working at the plant in Zeitz since 1999. He has helped to make it into what it is today. "Radici" is Italian. In the 1940s, Pietro Radici established his first textile firms in Northern Italy. These were then joined by plastics companies. From 1990 onwards, the Radici Group – which now employs around 3,500 people worldwide and has an annual turnover of around one billion Euros – further strengthened its market position in the field of technical plastics and enhanced it with the production of chemicals. 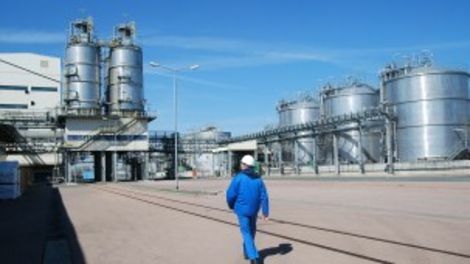 A key project in this development proved to be the choice to produce adipic acid in Saxony-Anhalt. Approximately 230 million Euros have so far been invested there. After a construction time lasting just three years, production there started in 2002. The complex now has achieved an annual capacity of 107,000 tonnes. "We are a straightforward manufacturer. And incidentally, the only plant in Europe which only produces adipic acid without any further processing on-site," explains Jens Metzner. The white powder from Zeitz Industry Park in Saxony-Anhalt mainly goes to customers in Germany and Europe, but is also exported to buyers in Taiwan and Korea. Radici Chimica Deutschland has 200 employees in Zeitz. This makes the company the biggest business on the site of what was previously the Zeitz hydrogeneration plant. The German federal government and the federal state of Saxony-Anhalt provided 23 million Euros in the development and regeneration of the new Industry Park. "The location offers many advantages. It has the raw materials that we need. The hydrogen, for instance, is supplied by pipeline from Leuna. The local region also offers a talent pool, with the employees we need. And naturally, the financial support on offer in Saxony-Anhalt has also played a big role," explains Pio Gazzini, Technical Director at Radici Chimica. As Works Manager until 2005, Gazzini helped develop the factory owned by the northern Italian group. Furthermore, in the mid 1990s the group decided it wanted to gain better access to eastern markets from a base in central Germany. That was another reason to decide in favour of the site in Saxony-Anhalt. On a visit to the company, Harmut Möllring, Saxony-Anhalt's Minister of Economic Affairs, spoke with Pio Gazzini and Jens Metzner. "We are very pleased to have this company in Saxony-Anhalt. The federal state will continue to everything it can to create the best possible business environment for it," highlighted the Minister. At the same, time, Radici is to continue to invest in its modern production site, further strengthening the future of the company, most recently in the shape of an especially forward-looking investment. A modern cogeneration plant has been built which will secure the entire steam requirements of Radici Chimica all-year-around, and will also cover some of the company's electricity requirements on the basis of combined heat and power generation. In addition to the highly efficient and economical supply of energy, in the new plant, the climate-damaging nitrous oxide which arises during the production process is almost completely degraded. This benefits the environment and also saves energy and time, explains Metzner. At Zeitz Industry Park, 310 tonnes of adipic acid are produced each day, with the systems running around the clock. The employees work in three shifts. In the "delivery" area, long rows of big bags are ready to go, weighing 500 to 1000 kilograms. They leave the plant in HGVs or in tank wagons. The adipic acid production is based on two processes and just four raw materials. Every day, 266 tonnes of nitric acid are produced in the plant from ammonia and oxygen. Around 250 tonnes of Superol are also produced every day – from a reaction between phenols from Leuna and hydrogen, which Radici also receives via pipelines from Zeitz or the neighbouring town of Böhlen. Heated by catalysts, the adipic acids are produced from nitric acid and Superol under considerable heat. It is also found in sugar beet and beetroot, and is even used as an acidifier in food products.